South Africa will be without two of their most experienced players in their upcoming limited-overs series against Zimbabwe. 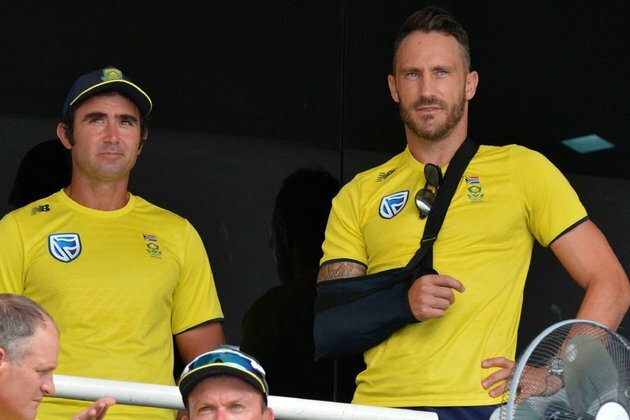 Captain Faf du Plessis has been withdrawn from the ODI series to fully recover from a shoulder injury, while Hashim Amla has been ruled out by a torn finger tendon, picked up during the Caribbean Premier League. Dean Elgar, the Test opener, has been been called up to replace Amla in the one-day squad, for the three-match series starting in Kimberley on Sunday, while JP Duminy will lead the side in du Plessis' absence. "Hashim sustained a tear to the tendon in his left fifth digit while fielding during the recently concluded Caribbean Premier League," team manager Dr Mohammed Moosajee explained. "The injury will need up to three weeks to heal, making him unavailable for the series against Zimbabwe." Du Plessis is recovering from his second shoulder injury in less than a year. He had surgery on his right shoulder in late 2017, and missed the end of South Africa's tour of Sri Lanka in August this year, with a rotator-cuff tear in the same shoulder. The CSA medical team, as a result, decided to not rush his return, ahead of a busy summer and the 2019 World Cup. "The CSA medical committee has also withdrawn Faf from the ODI series," Moosajee said. "He has not made a satisfactory recovery from his shoulder injury and has been given more time to make a complete recovery. We are hopeful he will be fit enough to return to lead the T20 side for the three-match series against Zimbabwe." The absence of the two seniors will allow South Africa to test their bench strength against somewhat modest opposition, and also give an opportunity to Elgar to push his claims for a spot in South Africa's top order ahead of the World Cup. Elgar, who has played just six ODIs for South Africa since his debut in 2012, with his last match coming against India in Mumbai almost three years ago, is known to be desperate for a one-day call-up ahead of next year's World Cup, and would have been on the selectors' radar after topping the batting averages for Surrey in the Royal London One-Day Cup this season, where he struck three fifties and averaged 57.25. "We have said that the Zimbabwe series is an opportunity to further explore our ODI options and the unfortunate injury to Hashim gives us an opportunity to see what Dean is capable of in the limited-overs format," Linda Zondi, the CSA national selection panel convener, said. "He has always been on our radar having put in consistent performances both in South Africa and the UK, and brings a wealth of valuable experience to the batting group in Hashim and Faf's absence." Keshav Maharaj has also been released from the ODI squad and will play for the Dolphins in their first round four-day competition fixture against the Titans, starting at SuperSport Park on Wednesday.